If you’re looking for a springtime day trip while you’re staying in the North Carolina mountains, and want to see some of the area’s truly photogenic scenery, check out Crabtree Falls. This wildflower and waterfall hike is north of Asheville, off the Blue Ridge Parkway near Milepost 339, between Mt. Mitchell State Park and Little Switzerland. Crabtree Falls is about an hour from the Inn on Mill Creek B&B, and is a good recommendation if you want to take a day for traveling along a portion of the Blue Ridge Parkway, a scenic byway that runs northeast through the western part of North Carolina into Virginia and provides panoramic views of the beautiful Blue Ridge Mountains. Crabtree Falls, a 70-foot waterfall, is accessed via the Crabtree Falls Loop trail, which has a couple of options. You can hike just under a mile to the waterfall and then turn around and head back to the trail’s start, or you can get to the waterfall and then hike another 2 miles to complete the trail’s loop. The first option is easier and shorter, of course, while the second option, which has a moderately strenuous portion, gives you lots of opportunities to view woodland wildflowers and plants and do some birdwatching. Here’s an excellent trail description from our friends at HikeWNC: www.hikewnc.info/besthikes/blue-ridge-parkway-section-3/crabtree-falls. Additionally, we have trail maps here at the Inn for our guests. This also happens to be a great summer and fall trail, although you’ll see fewer people in spring. 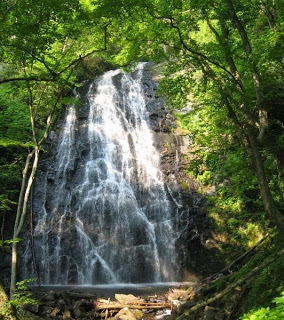 To get to Crabtree Falls from the Inn on Mill Creek B&B, travel east on Highway 70 through Old Fort to Highway 80, which goes 12 miles north to the Blue Ridge Parkway. Take the Parkway north and turn left at the Crabtree Falls Campground at Milepost 339.5. The parking area for the Crabtree Falls Loop trailhead is on the right before you get to the campground pay station. This entry was posted in Blue Ridge Parkway, Hiking and Waterfall Trails and tagged Blue Ridge Parkway, hiking, outdoors, Spring, Summer, waterfalls by Inn on Mill Creek. Bookmark the permalink.